This is the first publication to identify a universal procedural code for international commercial arbitration. This informative and well-argued discussion of a uniform code for due process is a useful aid for both practitioners and scholars. More than just a useful desk reference, this publication uncovers a unifying arbitration principle in light of the diversity of national traditions. The authors demonstrate how this unifying principle might establish a new standard procedure in arbitration law. Guiding the reader through a step-by-step analysis of due process in international commercial arbitration, the book is comprehensive without being esoteric. Due Process in International Commercial Arbitration, Second Edition thus helps both practitioners new to arbitration procedure and experienced attorneys looking for a cutting-edge discussion of due process issues. It can be used as a handbook for lawyers engaged in arbitral disputes. 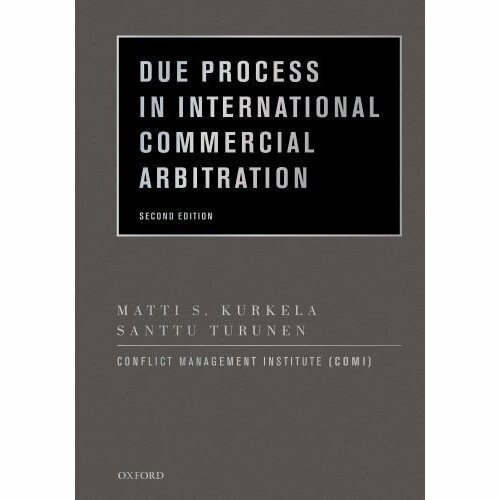 To provide the necessary guidance for lawyers in need of quick, reliable information, authors Matti Kurkela and Santtu Turunen update readers on the numerous changes made to arbitration law since the book's 2005 edition. Even more helpfully, Kurkela and Turunen have added two new chapters to show lawyers what to expect in the midst of an arbitration proceeding: a chapter on procedural rules from the New York Convention and a chapter on jurisdiction arising from sources outside the arbitration agreement. As corporations engage in more globalized commerce, and as arbitrators resolve more international legal disputes, this resource provides both the broad background and the quick reference information necessary to understand the complexities of arbitration procedure. A thorough Table of Contents, Index, and Appendix of primary documents facilitate practitioners' research in this vital book. This new edition's balance of comprehensiveness and concision make it a one-stop resource for arbitration attorneys around the world.